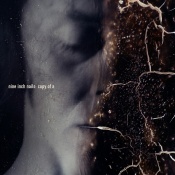 "Copy Of A" is the second track on the 2013 release Hesitation Marks. On August 12, 2013, Amazon UK officially made the track available as a free digital single. It was also released on Amazon US the following day, although as of August 20, 2013, it is no longer free. Those who pre-ordered the album through nin.com were given access to a FLAC download of the track simultaneously. A two-track promotional CD acetate was also released. The artwork for the MP3/CD is a portion of the vinyl cover art for Hesitation Marks. This song debuted live on the first night of the NIN 2013 Festival Tour. During the Tension 2013 Tour, this song was usually the first song in the set. When it was played later in the show, it featured backing vocals by Lisa Fischer and Sharlotte Gibson. This page was last modified on 13 April 2019, at 18:36. This page has been accessed 73,696 times.